Did you notice the SkyCarts? They have their appearance in this video between the 19th and the 34th second. The Hopper Bus is a new and intriguing concept. It includes amenities such as the double-decker viewing experience, table-style seating, free WiFi and outlets, a snack bar, and a dedicated on-board concierge to help with all your needs. All this without the pain of parking! The Hopper makes it easier than ever to see the best spots in America’s Finest City, whether you’re visiting for a family vacation or making the most of a business trip. The Hopper Bus concept is well conceived. It offers real benefits in a comfortable and convenient package. You can see many attractions of the city while never have to worry of how to get from one to the other – or where to park the car. During the hopper ride, snacks and drinks are being served from the SkyCarts on board, just like on a first class international flight. 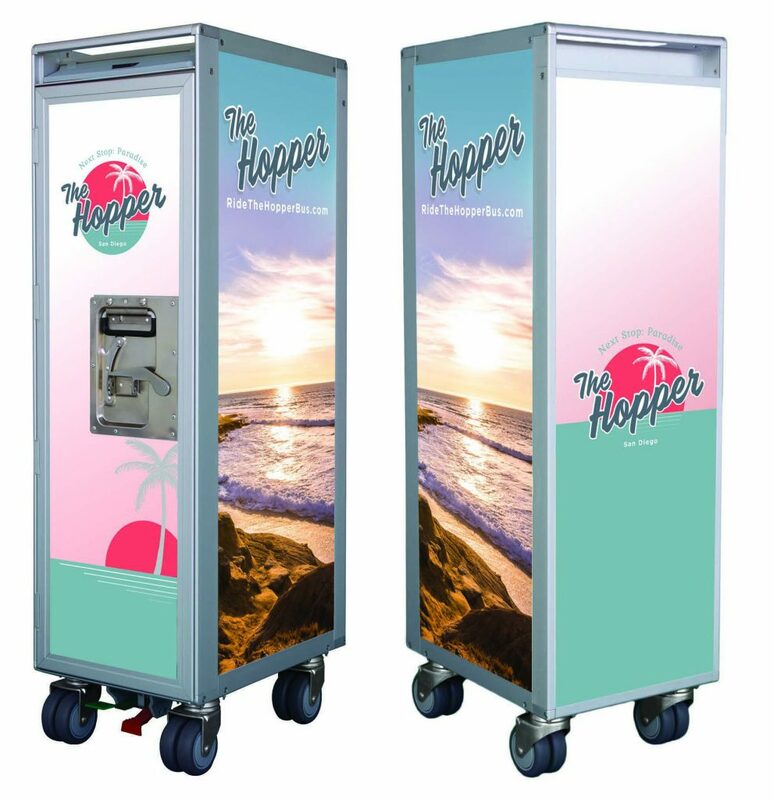 The SkyCarts are customized to show the Hopper Bus’ company colors and the distinctive logo. They created their own artwork. For this purpose we supply our customers with a template which enables a graphic designer to create the print files for complete customization, based on exact dimensions and specifications. If you want to know more about the customization options for the SkyCart please click here. And if you are planning to visit San Diego, do not miss to hop on The Hopper Bus!